The car trailer is a fixture in the racing world. As trailer use grows and sales of all kinds of transporters skyrocket, more and more racers are doing high-style hauling. 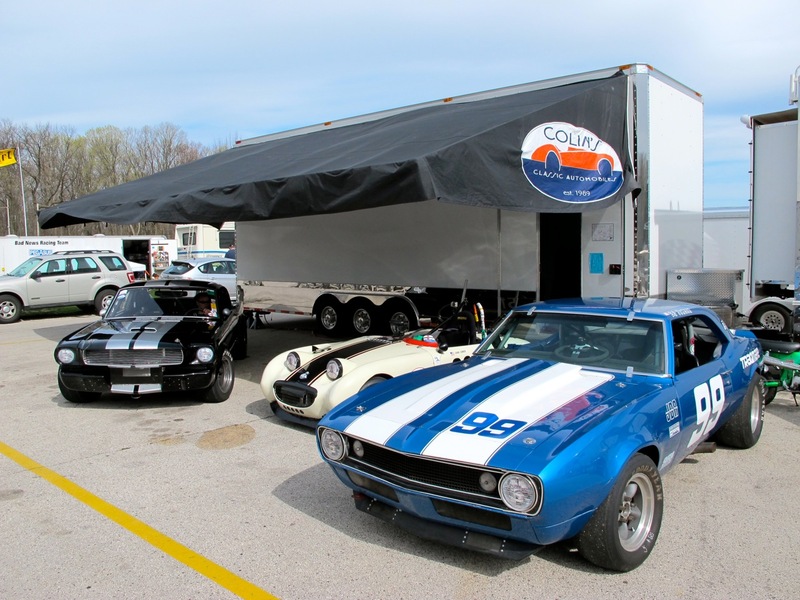 At any venue from dragstrips to vintage road race courses, you’ll see trailers dressed up, inside and out, with graphics, chrome, checkered flag floors, custom paint jobs and all sorts of other goodies. Race trailers have a dual personality. They have their functional character involving such things as getting a car aboard, cinching it down so it stays put and taking it safely to its destination. From highway mirrors to tie-down straps to hitch balls it takes a lot to make a trailer function well. But trailers also have a cosmetic character involving size, shape, design, color and decoration. 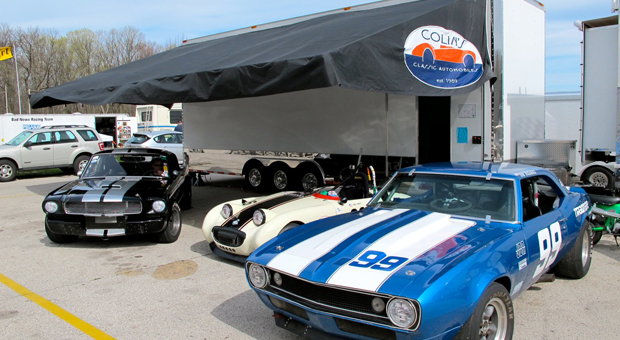 This month’s “trick trailer” belongs to Colin Comer, the owner of Colin’s Classic Automobiles in Milwaukee, Wis. Comer is a restorer, author, racer and collector who’s complete profile can be viewed at his website www.colinsclassicauto.com. The trailer is a 2010 Renegade ITS30 stacker trailer that’s pulled to a wide variety of hobby events with a Renegade 45’ motor coach. We’ll be looking strictly at the trailer today. 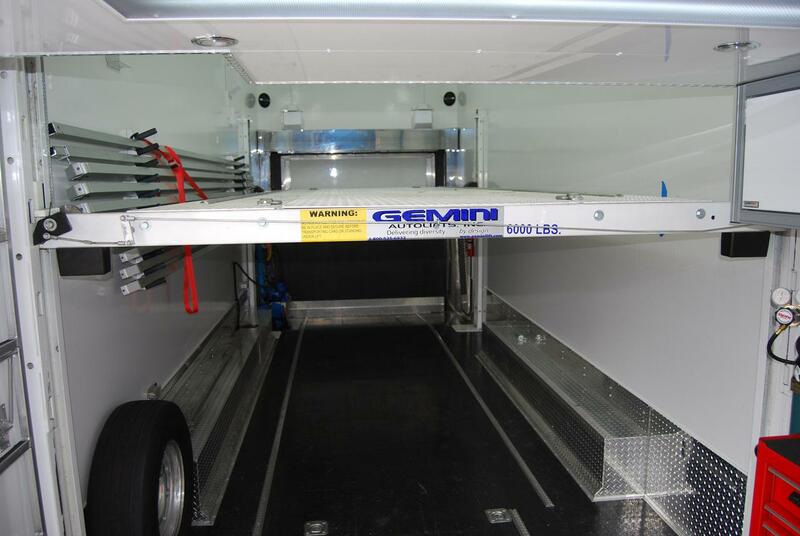 It is a 30-foot-long racing style unit with a 16-ft. interior lift that allows carrying three cars inside, two at floor level and one on the hydraulically-operated lift above them. The interior features a clean, purposeful look with a very well thought out interior layout. The color scheme for the trailer is basic white, with polished diamond plate accents and aluminum trim throughout. All of the cabinets are white with aluminum trim and are neatly labeled with their contents. The sturdy cable-supported drop-down door at the rear of the trailer serves as the car entrance ramp. If three cars are being carried, the “upper deck” car is loaded first, fastened to the lift and raised so that a small car and a second car can be loaded “downstairs.” Colin and crew use over-the-tire straps to cinch the cars tight to the track in the floor. This method of securing by the tires with soft straps allows the car to ride on its suspension during transport and guarantees no damage to sometimes fragile or carefully painted chassis components. Colin even had special straps custom made for the 13-inch tires on his wife Cana’s Austin-Healey Sprite vintage race car. The steel diamond plate lift has ramps and a center plate that are painted white to match the cross members. 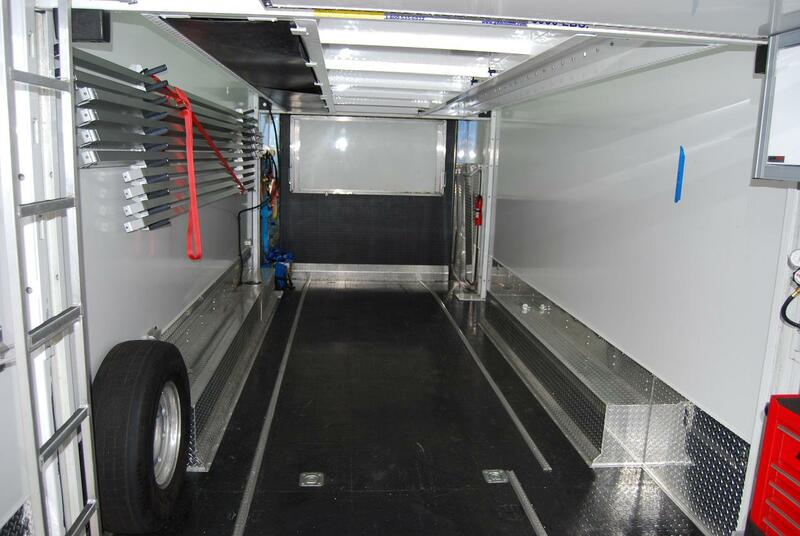 The trailer floor is covered with a black “coin pattern” vinyl, also used on the inside of the rear ramp door. One negative noted by Colin is that the glued-down vinyl can lift in hot weather. The best solution is to keep it protected from the sun. A pair of shiny diamond plate ramps attach to the right wall with brackets. These ramps are needed to get the upper car on the lift, which sits on steel cross members that hold it up a few inches above the trailer floor. A fire extinguisher is also wall mounted nearby. Along the bottom of the wall are the wheel wells covered in polished diamond plate. About three feet beyond the hoist is a green nitrogen tank and red rolling Snap-On toolbox it. 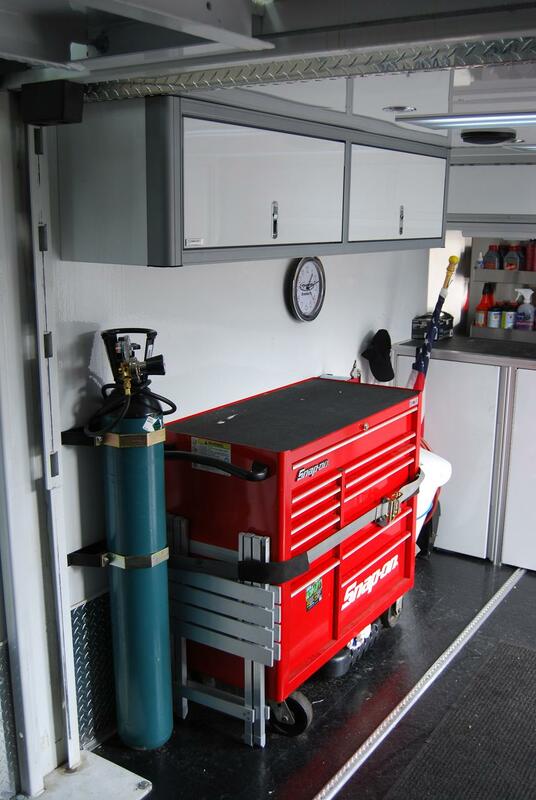 The toolbox is fastened to the wall for transport with a fat tie-down strap but is easily wheeled outside at the race track. The nitrogen is used for race tires and topping off nitrogen filled gas shocks. Stowed next to the toolbox for transport are a trash container, 3-ton aluminum floor jack, US flag, drain pans and other items. A clock is on the wall above and, at the top of the wall, more overhead storage cabinets. The front wall of the trailer features white baseboard cabinets with a black work surface on top of them. 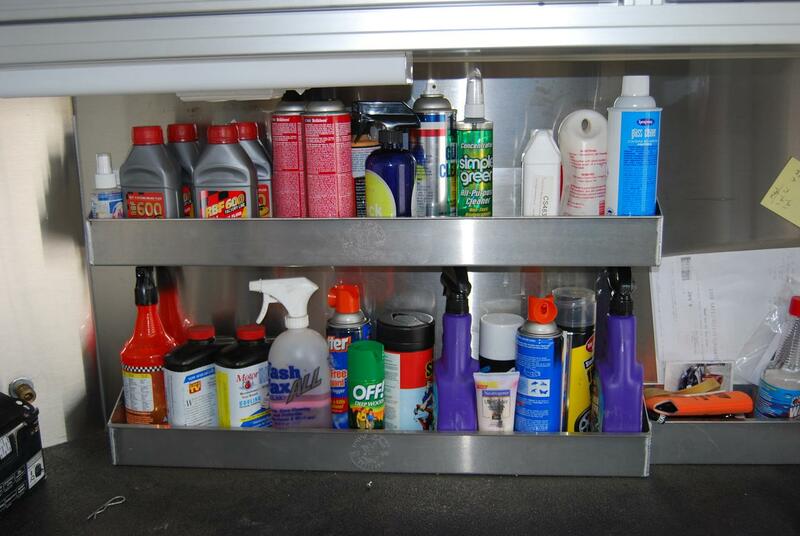 Several pieces of the stainless steel trailer furniture made by Pit Pal Products holds various lubes and spray cans. 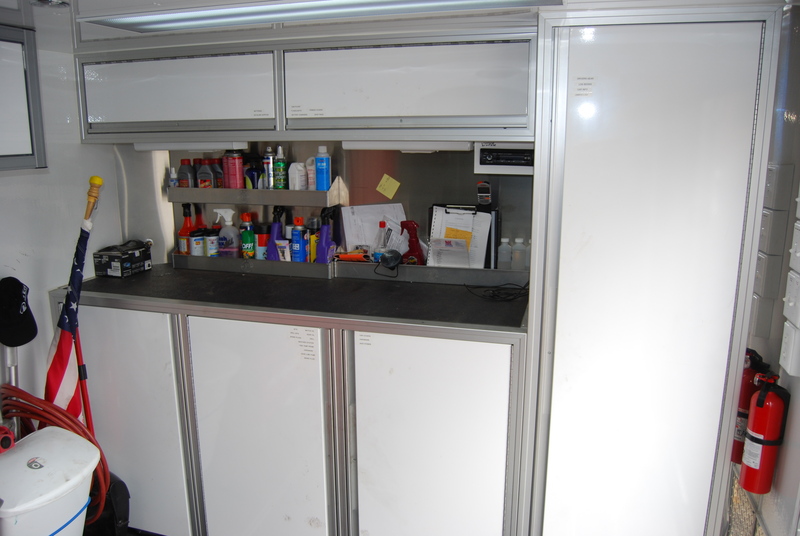 Overhead cabinets hold more equipment and the driver’s racing gear is stored in an upright clothing cabinet. The cabinets also house a satellite radio system and iPod connection that feeds speakers both inside and outside of the trailer. Another fire extinguisher is mounted in the front right-hand corner, near the service door. The right wall beyond the door holds an aluminum ladder that takes you to the trailer’s upper deck. The spare trailer tire and wheel are mounted between the ladder and the wheel well. The wall has brackets for the custom awning framework that is erected on the outside of the trailer at the destination. 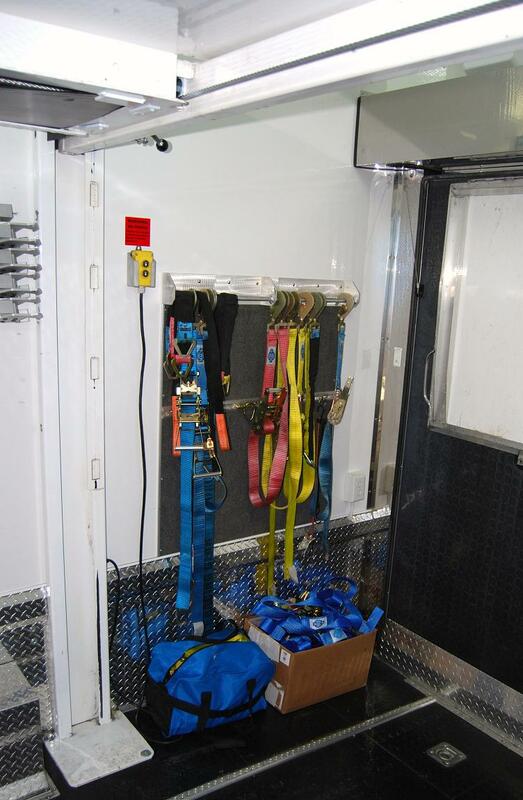 The rear few feet of the wall hold the tie-down straps, which hang from a Pit Pal Products wall bracket. The remote push-button controller that raises and lowers the lift sits in a wall-mounted bracket. To allow the third car to be raised on the lift, there is nothing in the upper part of the rear of the trailer, but in the front upper part there is a storage loft. It holds a well-secured 55-gal. 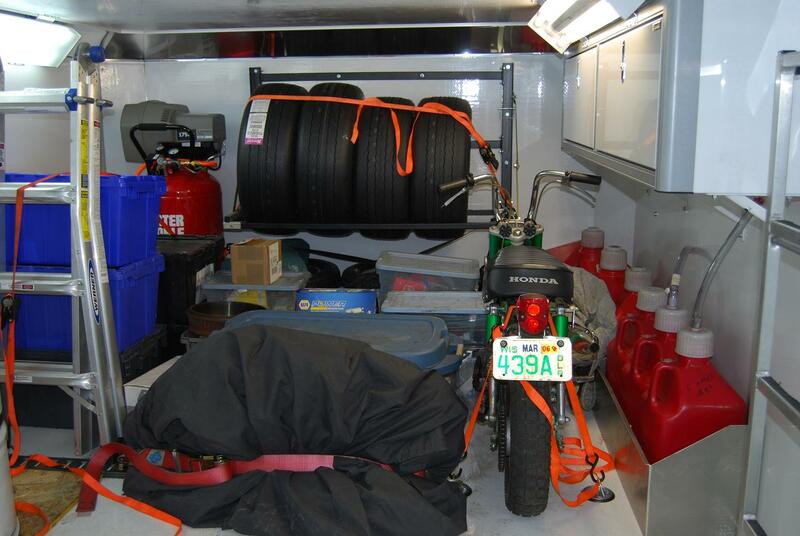 drum of racing gas (to ensure that water-contaminated fuel doesn’t go into an expensive racing engine), plastic storage bins, the air compressor, extra racing tires, a mini-bike, quick-fill gas cans and other racing necessities. Overhead storage cabinets and lights are mounted on the upper sidewalls. Both 12V and 110V lighting is used throughout the trailer, and on the exterior there are dual halogen flood lamps on both the right side and rear of trailer, which Comer says are quite handy for late-night car prep at the race track.